An overwhelmed Jeevabai rushes towards her daughter-in-law to show a photograph of a camel herd swimming in sea water. Curious, other women of the house in Kachchh’s Laiyari village surround the two. The picture features the Kharai camel--a breed that can swim up to three kilometers into the sea in search of mangroves, its primary food. Jeevabai’s excitement stems from nostalgia. “When I was married, my in-laws owned 5,000 of these camels. But now less than 500 are left which have been sent to Aliabet (an island in the Narmada Delta) because there is no food for them here,” she says. Her in-laws, like most families in Jatt and Rabari communities of Kachchh, are traditional rearers of Kharai camels. Given the breed’s ability to survive both on land and sea, the Kharai camel is one of the most preferred choices of graziers in the arid coastal region of Kachchh. People consume its milk, while male calves are sold for economic returns (females are not sold because they are considered sacred). A male calf fetches anywhere between Rs.6,000 and Rs.14,000, says Ramesh Bhatti of Sahjeevan, an NGO working on livelihood issues of graziers in Kachchh. The camel’s unique quality to survive on mangroves has become a cause of its suffering. Due to the growing control of industries in the coastal region of Kachchh and the Gujarat forest department’s rigidity in not permitting grazing in mangroves, the Kharai camel has lost access to food. The consequence is worrisome. The breed population has declined drastically. Three decades ago, there were more than 10,000 Kharai camels in Laiyari. Now they are just over 1,000, says Pachanbhai Rabari, son of Jeevabai. Breeders in Laiyari send their camels with graziers to graze on mangroves in the nearby Mohandi and Bhagodi Vandh villages. But almost half of the mangroves in the two villages have been destroyed by a jetty constructed by a cement factory, informs grazier Ahmedbhai. “The camels now have to swim double the distance to reach the mangrove,” he adds. The Kharai camels in Tunda Vandh village are facing a similar fate. Till 10 years ago, the village had 1,500 such camels. “There are less than 250 now,” says resident Hirabhai Rabari. The coastal village falls between two power plants near the Adani SEZ in Mundra. Its direct access to the sea was cut by a canal and conveyor belts built by the companies running the power plants. “We had to walk for six kilometres to reach the sea. Many camels died or were abandoned because no food was left due to industrialisation,” says Hirabhai. The two power companies recently built an iron bridge over the canal to allow residents access to the sea front. “The camels use the bridge to go to the mangroves but there is hardly any vegetation left there,” says another resident of Tunda Vandh. The Kharai camel’s decline has hit breeders hard. Many of them have abandoned camel rearing and, due to lack of other skills, are working as daily wagers. There are also not many buyers for the calves. Ahmed bhai, a grazier from Nimribandh village, says at least 15 to 20 calves were sold every year from his village. “For the past two years, no buyer has landed in my village,” he adds. With the advancement in the transport sector, the demand for camels has reduced, points out D N Rank, professor of animal genetics at the Anand Agriculture University. “Besides, there is no market for camel milk,” he adds. Despite growing industrialisation, Gujarat registered a 13 per cent increase in the total mangrove cover between 2005 and 2011. This is because of the aggressive plantation drive by the forest department. The department has categorically refused to allow grazing on its plantations. “The camels have nowhere to go. First industries destroyed the mangroves, then forest department fenced the fallow land after plantations,” says Malabhai Rabari of Laiyari. Pachanbhai says the industries and the government are denying him his rights. “I have documents to show the Maha Rao (ruler) of Kachchh had given my ancestors the permission to graze camels in the mangroves. Later in 1960s, the state forest department also gave us a similar permission,” he adds. 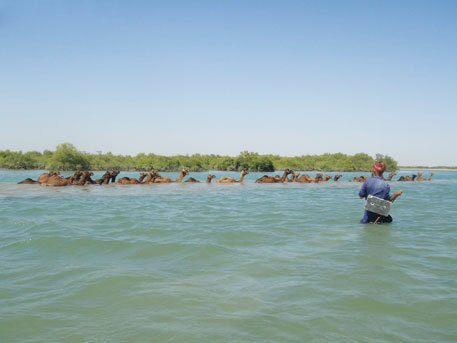 In the absence of food, some Rabaris have moved with their Kharai camels to the mainland and stopped feeding them on mangroves, but it has not worked. “The breed cannot live without mangroves,” says Suleman Isa who took his camels from Aliabet to mainland Kachchh two years ago. Within six months, his 30 camels died. “Mangroves have disappeared in Aliabet. They say because of the dams on the Narmada not enough fresh water reaches the delta to feed the mangroves there,” he adds. Pachanbhai of Laiyari says the Kharai camel’s liking for mangroves is associated with a folklore. “About 400 years ago, there was a dispute between two brothers in a Rabari family over distribution of property. The family had only one camel, so they could not decide its taker. To find a solution, they went to Sawla Peer, a holy man who lived in the mangroves. Sawla Peer made a small wax statue of a camel and asked each of the brothers to choose between the real and the wax one. The elder brother opted for the living camel and went away. The holy man then advised the younger brother to immerse the statue in the sea and leave without looking behind. As the man did so, thousands of camels started coming out of the sea and followed him till he looked back. All those camels are now called Kharai camels,” he says. Since then the Rabari and Jatt communities rear the Kharai camel as a sacred animal. The camel is also considered the sacred vehicle of Momai Maa, a local deity worshiped by Hindus. Since the Kharai camel has not been recognised by the government as a separate breed of camel, there are no official figures on their numbers. However, a survey done by Sahjeevan in selected villages shows their population has declined by more than 85 per cent in the past two decades. At present, there are just over 5,000 Kharai camels in Gujarat. Officially, if the population of a livestock breed is below 10,000 in its native place, it is considered threatened. 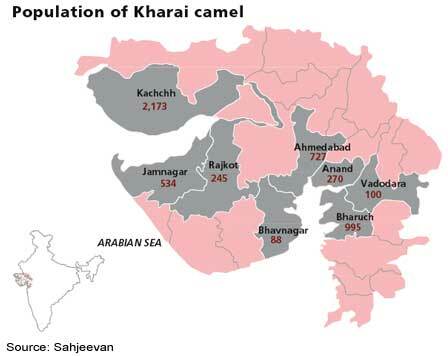 While breeders in Kachchh are aware of the two varieties of camel-Meethawala or Kachchhi camel in the mainland, and Dariawala or Kharai camel along the coasts-the government was not aware of the Kharai breed till recently. The authorities always included Kharai camels with the Kachchhi. In fact, the Kachchhi camel was declared threatened in 2007 as it counted 8,186 in Kachchh, below the 2003 count of 10,477. 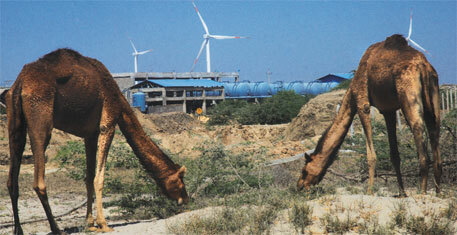 The population of Kachchhi camel across Gujarat is 30,000. “It was only when we started working for the conservation of Kachchhi camel three years ago that we came to know about the Kharai camel,” says Bhatti. The Kachchh Camel Breeders Association plans to apply to the animal husbandry department for the recognition of Kharai camel as a separate breed. “Not in just grazing and rearing practice, the Kharai camel is different from Kachchhi in physical characteristics as well. Its head and hump is smaller and has a thinner skin. Its wool is much smoother than that of Kachchhi,” says Kiran Patel of The Kachchh Camel Breeders Association. A study by Anand Agriculture University has established that the Kharai camel is genetically different from the Kachchhi camel. “We found 10-15 per cent gene variations between the two,” says Rank. The professor at the university warns there is a greater threat of mixed breeding of Kharai and Kachchhi camels because of high migration rate. “It is important to preserve the Kharai camel breed because we do not know what advantage can this important germplasm provide in the future,” he says. As other animals are decreasing in India.. I pray to god that like them human count should also decrease. Can nature decrease human counts in one decade to 10 Cr. that means more 110Cr people will be killed or die somehow. I am always frustrated with long queues, traffic, seats availability in trains etc. Because this population everywhere life is hell in India. When are we humans going to realise that we should live and let other species live too? Probably time is not far away when we will find only humans everywhere and no other living species or vegetation. At that time we will start eating one another for our survival and govt might have to pass a bill which will allow killing or slaughtering of human beings by others for self consumption for survival.